Add lentils to boiling water, then garlic. After about 15 minutes, add buckwheat. After 12 minutes, start checking lentils and grain for texture. 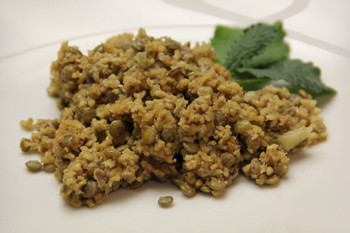 The lentils should be soft enough to easily eat and grains slightly firm. Cook longer for softer texture. Most of the water should be gone. For extra flavor add 4 tablespoons of peanut butter.